2. John Henry “Jack” Webster b 1771, Lincolnshire, Eng. Grimsby is supposed to be the place where the Danes landed on their first invasion of Britain near the close of the 700’s, so it’s likely the Shaws have some Danish blood. Charles’ parents are unknown. 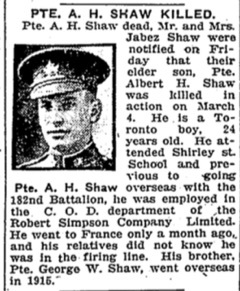 His father was possibly John Shaw (not sure which one though). Charles married Martha ?. She died before 1841. 2.Charles, 1811-?, m Mary ?, children: Elizabeth, William, Thomas. He may have died in 1859 in Caistor, Lincolnshire. Charles died after 1841. Not sure where he was buried though it would surely be in Grimsby. The Grimsby Cemetery started in 1855. There are no longer any headstones at St. James Cem; they were cleared off. But there was a transcription of headstones in 1900. George Shaw was born 1804 in Great Grimsby, Lincolnshire, England. He was baptized in Grimsby Oct 5, 1804 at St. James Church. He became a master tailor. On July 6, 1828, George married Jane Robinson (daug of Jabez Robinson and Thomasin Graul) in St. James Church, Grimsby. 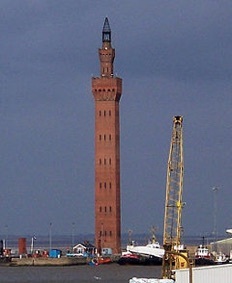 George and Jane lived in Grimsby and had 9 children. He became a freeman (with rights to vote) in all 3 of the ways available: he was the son of a freeman, he served 7 years apprentice to a freeman (his uncle Alderman Kennington) and he married the daughter of a freeman, Mr. Jabez Robinson. See p. 199 of the book “Old Grimsby”, written in 1897 by his son, George. The Shaw family were Methodists. John Wesley himself traveled to Grimsby several times between 1743 and 1788 along with several other Methodist preachers in a hard-fought struggle with the established church to build a Methodist congregation there. The first Methodist church was built there in 1757. A larger building built in 1808, was enlarged in 1837. Then another building was built in 1847. After that time several churches were built for Methodists in Grimsby. . . . . Jane - 51 "
. . . . William Henry - 20 "
. . . . Fanny Maria - 16 "
1881 England, Lincolnshire County, Great Grimsby, South West, St. James, 4 Yarborough St. There was a book “Old Grimsby” published in 1897 written by Rev. George Shaw, son of this George Shaw. It has some interesting stories. Some stories on local elections was very interesting, starting on page 193. In this book George (Jr) mentions his “uncle Alderman Kennington” (p199) and aunt Molly Wharton (p200). George (Sr.) named one of his sons Thomas Wharton, so perhaps he was named after Molly’s husband, George’s brother-in-law. Don’t know if Molly was a sister of George (Sr) or Jane. 2. Rev. 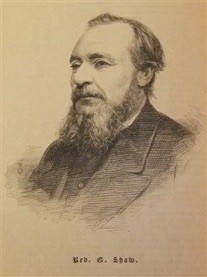 George, 1830-1903, became a Methodist preacher, pics at right in 1883 & 1903. 3. Charles Robinson 1834-1916, moved to Canada. 5. Mary Jane, 1839- m James Thayers and moved to Canada in 1882. George Shaw died Mar 16, 1888 in Lincolnshire, England and was probably buried at the Scartho Road Methodist Cemetery in Grimsby. See his Find-a-grave page. His son, Rev. George was also buried there in 1903. George’s wife, Jane, lived until June, 1898. Charles Robinson Shaw was born Aug 20, 1834 in Great Grimsby, Lincolnshire Co, England, the son of George Shaw (1804-1888) and Jane Robinson (1808-1898, Jane's father was Jabez Robinson). He was baptized Sept 15, 1834 by William Wombell at Great Grimsby. Since George was a freeman of the town of Grimsby, Charles and his siblings received a good education at the local school (called "college"). Charles' son, George Shaw, wrote a book, Old Grimsby (1892) with some references to the family on pg 199-200. George (son of Charles, b abt 1771, Lincolnshire) had also been born in Grimsby, baptized Oct 5, 1804. He became a master tailor. He married Jane Robinson July 6, 1828 at St. James Church (Anglican) in Grimsby. At some point the Shaw family became Methodists. John Wesley had himself preached several times in Grimsby in the mid-1700's and after a struggle with the established church the Methodists built a congregation there. Primitive Methodism (of which Charles was a part) was introduced to Grimsby in 1819 by Rev. Thomas King [Old Grimsby, p238]. Perhaps this Shaw family was connected to the Wesleyan Chapel in Great Grimsby. The schools in Great Grimsby were all by fee. In 1851 the Wesleyan Day school had 200 students; by 1858, they had 800 students! The Methodists were very active in this area and had several churches. A later bio says that Charles went to college, however, the secondary schools of that day were sometimes called colleges, so we can’t assume that he went to university as we know it. He became a painter. Charles Robinson Shaw married Jane Elizabeth Barnett, Nov. 7, 1858 in Hackney, Middlesex Co, England. The Barnett family was from Bridlington (formerly called Burlington) in Yorkshire, England. Since his wife was not from Lincolnshire, he must have moved to London to work or go to school, met and married his wife there. Their first child, Jane, was born back in Grimsby in 1860, but they were again near London in 1861. In 1867 Charles' son, Jabez was born in Chelsea, Middlesex Co (near London). Charles R. went to Canada in 1869 with his wife and 2 children, not sure which. He had 3 children: Jane Elizabeth, Anna Keziah & Jabez. 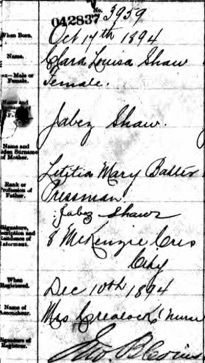 Jabez isn't on the 1871 census, but it doesn't seem likely they would have left him in England. A later bio of Charles says that he brought his wife and 2 children to Canada. Jane probably died young, and he brought Annie & Jabez to Canada. Charles' wife, Jane, died April 12, 1872 of tuberculosis. Buried Apr 14, Toronto Necropolis Cemetery. Charles remarried in Toronto in 1880. Marriage record: "Charles R. SHAW, 46, widower, glazier (painter), Lincolnshire England, Toronto, s/o George SHAW & Jane, married Mary D. REID, 32, widow, Cornwall Ont, Toronto, d/o Alva S. EASTMAN & Sarah, witn: H. Edwin TRENT & M. A. CHARLTON, both of Toronto, 22 Dec 1880"
Charles and Mary’s first child, George, died in the fall of 1881 when he was 2 weeks old. Charles moved west to British Columbia in 1889. He left his son, Jabez in Toronto. Jabez married in 1890. Charles he became the first mayor of Burnaby, British Columbia (near Vancouver) in 1892. 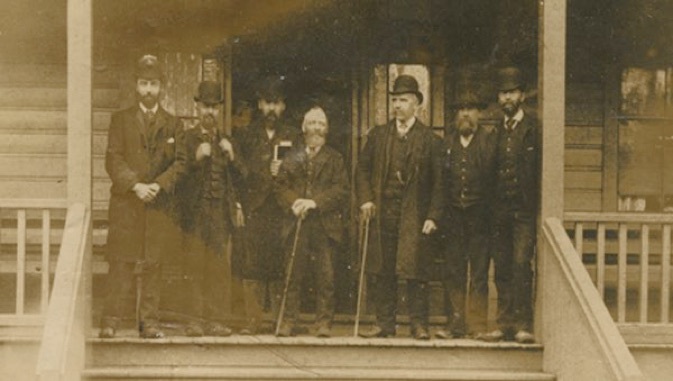 Below is a picture of the town leaders, with Charles in the center (from the city of Burnaby website). "Charles R. Shaw First Burnaby reeve [mayor] b. Aug. 20, 1834, Great Grimsby, Eng. ; d. 1916, Ann Arbor, Mich. After a college education, he immigrated to Toronto in 1869 with wife and two children. A Wesleyan Methodist preacher, he declined ordinance. 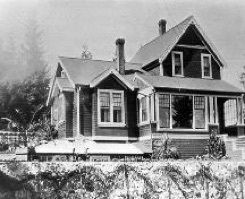 In 1889, moved to New Westminster, building a home at 4th St. and 3rd Ave. Worked as a decorator, paperhanger and painter. On Oct. 8, 1892, local property owners unanimously voted him first reeve (mayor) of Burnaby (pop. under 200). With his ailing wife, he moved to Kamloops in 1894. After her death, moved to Ann Arbor." At right is a picture of his house in Burnaby. This house is listed on Historic Places in Canada. In 1893 their 10-year-old daughter, Sarah Mariam died. Because of Mary’s health, in 1894 Charles and Mary moved to the Kamloops District of British Columbia. Mary died there in 1897 and was buried in the Pioneer Cemetery there. Charles moved back to Toronto for a short while, but then he moved on to Michigan (to Ann Arbor or Benton Harbor). There is a mention of Charles R. Shaw in the News-Palladium newspaper from Benton Harbor, Michigan, Feb 21, 1899, page 4. 2.Annie Kezia, 1865-1940, m Stephen Thomas Copley, children: Alma Amy 1887, Muriel Kezia 1889. All this family moved to British Columbia with her father and stayed there. 3.Jabez, 1867-ca1937, m Letetia Mary Baxter, stayed in Toronto. Jabez Shaw was born Jan, 1867 in London, Chelsea, Middlesex County, England. He moved first to Canada with his parents in 1867. I don’t see him on the 1871 census with his father in Toronto or his grandfather in Grimsby, England. His mother died of TB in 1872 in Toronto, Canada. His father remarried in 1880. He was living with his grandfather in England in 1881. Jabez came to Canada in 1882, arriving at the port of Quebec July 4th. 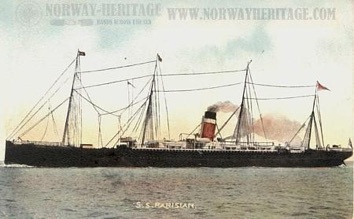 (A website with the voyages of the Parisian says that it left Liverpool on June 29 and arrived in Quebec July 7.) He was 15 years old and came with his aunt and uncle, "Mary J. (42) and James (53) Thayers" (all 3 were on the same ticket). All 3 embarked June 29th at Liverpool, England on the ship Parisian, making a stop the next day in Londonderry, Ireland, with their final destination listed as Toronto. In 1886 his sister, Annie Kezia, married. In 1889 Jabez’s father, Charles, moved with his new wife and their 3 small children (Jabez’s half-siblings) to British Columbia, leaving Jabez and Annie in Toronto. Though Joseph Baxter's parents names are not listed on his marriage record, they are on his death record. The next year, April 23, 1890, Jabez Shaw married Letitla Mary Baxter in York, Toronto, Canada. 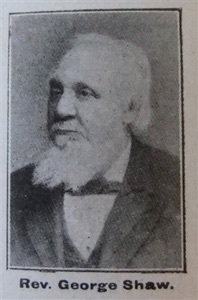 Jabez Shaw said on his marriage record that he was born in London, England about 1866, the son of Charles R. and Jane Shaw. In 1894 Charles's wife, Mary, became ill and they moved to Kamloops, BC. She died in 1897 and was buried there. Charles moved back to Toronto for a while. Jabez's daughter, Clara was born in Toronto in 1894. In 1900 Charles moved to Benton Harbor, Michigan where he died in 1916. 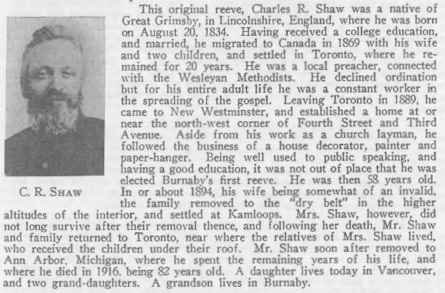 Shaw, Charles R. - 75, b England, widowed, emigrated 1900. He was living in a commune called "Israelite House of David", which was started in 1903. From wikipedia: "The House of David colony soon had several hundred members. In 1906, the House owned about 1,000 acres, on which the colony harvested fruit from a dozen orchards and cultivated grain. The commune had its own cannery, carpenter shop, coach factory, tailor shop, and steam laundry. They also owned and operated their own electricity plant, providing lighting to the community. It had three brass bands and two orchestras, and a zoological garden." Jabez was a Methodist. He was also a member of the Orangemen, a Protestant group in Canada. His name is on a 1926 list of officers, as District Master for Toronto West. "In the 1920s and 1930s when the Orange Association was at its peak, Toronto was known as 'the Belfast of Canada' and parades in the city were known to take some four hours to pass a given point. . . . No club, organization or group has produced more leaders in Canada at the federal, provincial and municipal level of government than has the Orange Association." (from OrangeNet). The Orangemen were named for William of Orange who restored protestantism to England in 1688. (See also pictures of OrangeMen). Here is a Orangemen letter from 1926 that Jabez would undoubtedly have read. They lived in several different places around York, Toronto, Canada. 1891 & 1893 when their first 2 children were born, they were at 20 Humbert St. 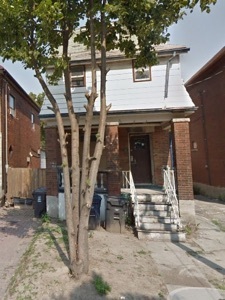 In 1896 when George was born, they were at 122 Clinton St, Toronto. Son, Albert’s war record says that in 1918 Jabez lived at 35 Cloverdale Rd, Toronto (see link to map; the house is still there). 3. Clara Louise, b Oct 1894, Toronto; d 1961; m John Wylie "Jack" Webster. 4. George William, b Mar 1896, Toronto; d abt 1975 in Vancouver; m Lila ?